Papillon Dogs - The Papillon is a small dog breed with distinctive large, fringed ears that earned it its name, the French word for butterfly. 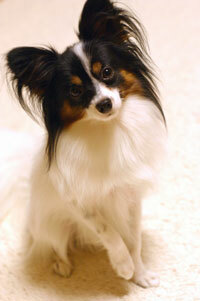 The Papillon is believed to be one of the oldest of the toy breeds. Though known to be reserved with strangers, these dogs can also be protective of a human family member, and are good alarm dogs while still affectionate to those they know. Papillons are very athletic, enjoying running or chasing, but usually enjoy staying indoors. This information is licensed under the GNU Free Documentation License. It uses material from the Papillon Dogs article on Wikipedia.org. Papillon Breeders - Advertise your kennel puppies and dogs here.